The pattern of society in the Highlands had come to differ profoundly from that prevailing in the Lowlands, but these differences have been dwelt upon in modern times rather more lovingly than the historical facts warrant. There was no particular distinction between Highland and Lowland as such in the early days of Scotland's existence. Differences were not fundamental; they developed, in consequence of certain facts of a practical nature, not from any mutual hostility, acts of will or racial distinction. The real point was that the medieval Scottish state and its rulers moved as far towards centralising authority as they reasonably could, but their success was limited by technology. Kings anxious to impose order and obedience could succeed within limited distances from the centre of royal power. At greater distances the task became increasingly difficult. Policing and supervision were more difficult to organise the further one went towards the periphery of Scotland. That is why the exercise of local independence as, for instance, by the Lords of the Isles, was feasible; and why the best that kings of Scots from Alexander II to James VI could do was to mount expeditions from time to time, to reassert the principle that the Highland areas were part of a greater whole. Between such periodic demonstrations however, the facts of time and distance took over, and power in the Highlands reverted to those who were strong enough to claim and exercise it in their own localities. Even this feature was not unique to the Highlands. Lowland nobles often enjoyed considerable freedom of action in their own areas; and in England too, the further north and west from London one might travel, the more immunity from royal control one would find. What did perhaps make a rather different case of the Highlands was that, unlike Lowland aristocrats in Scotland, or territorial magnates in England, the Highland chiefs are found very seldom playing any significant role in affairs of state or national politics. Of the truly Highland, Gaelic chiefs, only the Campbells of Argyle were consistently involved in such matters. Partly, therefore, indifference to Council, Parliament and state business in general on the part of the chiefs was responsible for the detachment of the Highlands from the rest of the country. Detachment, arising from the facts of geography and the purposes of the chiefs, was reinforced by developments over generations. In particular, English, the language of administration and commerce, came in time to dominate the Lowlands and the eastern seaboard, but Gaelic prevailed elsewhere, and a linguistic border is a very difficult barrier to surmount. Then, Protestantism gained the upper hand in the country, and, especially after 1690 and the Presbyterian victory, Gaelic became suspect as 'the Irish language' - a description habitually employed by the eighteenth century - and the Irish language was, by many, seen as some sort of adjunct to the Irish religion. The Catholicism of some of the chiefs had become another factor encouraging a sense of division. In their comparatively isolated territories, the chiefs and their followers had evolved a society whose assumptions and purposes differed greatly from the rest of the country. The chief's power, and his own sense of his power, was measured by the number of followers at his command, not so much because they could be organised to raise produce for his consumption, and deploy skills for his comfort, but because they could be commanded as fighting men. The clan was essentially organised for war, not for commerce. That is why the legislation after Culloden proved destructive to Highland society. The chiefs now had to maintain themselves as any other landowners had to do, and their lands had to be made to pay. As one observer has put it as a southern socialite the chief needed money, but as a tribal patriarch he could do little to raise it. So the clan as a kind of extended family, encouraged to think of itself communally, would have to give way to a society in which the owner of the land lived off rents, and the tenants' job was to pay these rents. Oddly enough, in the half century after Culloden the new relationship worked reasonably well. Estates of Jacobite chiefs were forfeited to the Crown, and placed in the control of Commissioners, who carried out in the Highlands many of the improvements which elsewhere had been sponsored by the Board of Trustees, and some of the men responsible for improved agriculture in the Lowlands served terms of office as Commissioners for the Forfeited Estates. Money was spent organising surveys and prospecting for coal and minerals; on land reclamation and afforestation; on premiums and bounties for linen and hemp production, and on public works programmes aimed at providing roads, bridges and harbours. 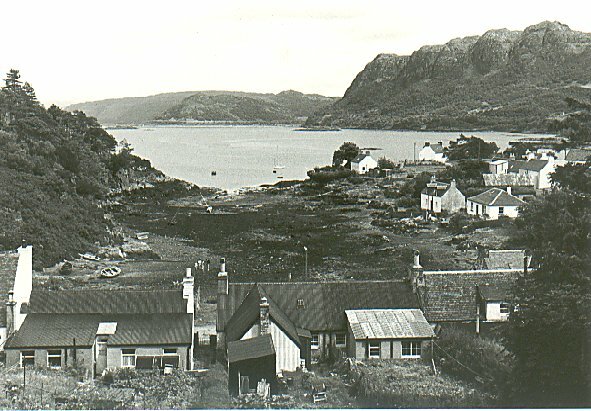 Attempts were also made to develop a fishing industry, with villages being constructed, or reconstructed, at, for instance, Lochinver, Ullapool, Plockton and Tobermory. So, though the chiefs had found their status profoundly changed, the economy of the Highlands did not at all collapse after Culloden. In fact there were indications that things promised to go rather well. In 1755 more than half of the population of Scotland lived north of the Tay, and almost one third of the total were natives and residents of the Highland, Gaelic area. For the next fifty years or more the population continued to rise, in some places at a quite staggering rate. Overall, the Highland population by 1830, had risen by about 50 per cent, and in the Outer Isles it had actually more than doubled. A population growth of this sort is usually taken to be an indicator of rising prosperity and such indeed was the case. Britain was involved more or less continuously in wars between 1742 and 1815. These wars were fought by British armies and warships in America and in India as well as on the European continent, and many Highlanders were recruited into the army, forming Highland regiments, and beginning the tradition of military service to the British crown which has endured ever since. Recruiting soldiers from among their tenants brought advantages to the landowners. Sometimes they were actually rewarded for their recruiting zeal, and, at least, if men went off to fight there were fewer mouths requiring to be fed from the produce of the estate. food per acre than any other crop. One of the early converts to the idea of potato-growing was the chief of Clanranald, who returned from a visit to Ireland in 1743, enthusiastically committed to potato growing. By 1800 potatoes provided 80 per cent or so of the diet of the Highlanders. With their own people thus provided for, the chiefs were able to make substantial profits by selling the other products of their land to meet the needs of the armed forces, a vast market for meal, cheese, meat, fish, leather, all of which the Highlands provided. Also, a new product was in great demand - seaweed or kelp - which, when dried and burned, left ash which was essential to a wide range of industries, notably glass and soap production. The chemicals necessary in these industries had been traditionally imported, especially from Spain, but that import trade had been greatly impeded by the succession of wars, and a home-produced substitute like kelp was a godsend, for which generous prices would be paid. In 1720 kelp ash was selling at £2 per ton. By 1790 the price was £10 per ton, and by 1800 it stood at £22. This was a boon to landowners. Lord Macdonald was reported to have earned £20,000 per year from the kelp produced from the seashores of his lands, and Clanranald made £98,000 annually. The landowners controlled the new industry totally, and naturally sought to expand it. Such expansion depended upon the willingness of the tenants to leave their fields and go kelping along the shores. This they were not always willing to do, particularly since the landowners paid wages which were absurdly low in proportion to the profits earned. The chiefs were not willing to reduce their profits by paying more generous wages to their tenants, so some other means had to be found to force the tenants to work in whatever way would bring greater advantage to the chiefs. A further method employed in Sutherland and on Skye was to remove tenants altogether from their traditional lands, and grant them holdings on inferior land, by the shore, most convenient to kelping and fishing. The landowners thus gained twice. They drew vast profits from the kelping and fishing labours of their tenants, and they drew high rents from new tenants invited into the lands vacated by their former occupants. These new tenants were usually sheep farmers - 'flock-masters' - mostly Lowland Scots or Englishmen who would pay well for the grazing rights in Highland glens. Whatever discontent these developments caused, most landowners neither knew or cared. Forty-six Highland landowners lived on their estates, but one hundred and forty-nine were 'absentees'. As the Earl of Seaforth put it, 'What Hebridean proprietor lives in his estate that can live elsewhere?' Discontent showed itself in various ways. Some tenants sought to emigrate, as many Highlanders had done in the 1760s and 1770s. The Highlands then had been abandoned especially by the tacksmen, the traditional right-hand men of the chiefs, their overseers and rent-collectors in peacetime, and their subordinate officers when the clan went to war. For these men, especially, the post-Culloden Highlands held little, and they had left in large numbers, leading many of their people to America and Canada, or to Lowland Scotland. Though the journey to the New World was long, it was often preferred. In Glasgow and the Lowlands, the Highlander was entering an established, English-speaking community, where he would be alien. In Canada or America he and his friends could establish their own Gaelic-speaking communities. So, emigration was seen by some as a preferred alternative to the increasing drudgery and dependence of life at home. But by now, in the early 1800s, men were valuable to the landowner, because they could earn money for him. Thus the landowners used their political influence and parliamentary power to place obstacles in the way of those who might wish to emigrate. In 1803 Parliament passed the Passenger Vessels Act, which, under the guise of enhancing safety on board ships crossing the Atlantic, set the fare for the passage at a level so high as to be beyond the capacity of escaping Gaels to pay. The government too did not look favourably upon emigration, which might reduce the number of potential recruits. Already enthusiasm for military service had declined, as resentful Highlanders, driven to small unproductive holdings and forced to engage in unwanted tasks, took a modest revenge by ignoring the pressures of their chiefs when the recruiting officers came round. Things changed very rapidly when the wars ended in 1815. Fighting men were no longer wanted. The price of kelp fell again to £2 per ton, and landowners quickly found that tenants were no longer an asset but were likely to become a burden. Thus in 1827 the restrictions of the Passenger Vessels Act were removed, and emigration was not only permitted but vigorously encouraged. The one promising source of income for the landowners remained the sheep farmers; and it became the policy of the chiefs to substitute sheep for tenants as quickly as possible. The Sutherland estates had pioneered the work, evicting tenants from their holdings throughout Strathnaver and Kildonan between 1799 and 1813. Now the example of Loch and Sellar was followed in South Uist and Wester Ross in the 1820s, in Skye in 1826, and in North Uist in 1828. Volunteers were encouraged to take passage for Canada and America, and when volunteers were not forthcoming, evictions and expulsions followed. One event which had frightened the landowners was a harvest failure in 1816, which had seen the people survive on shellfish and wild plants until the 1817 crop was safely gathered. A disaster of similar sort, but on a scale undreamed of, now struck the Highlanders. In 1845, just as in Ireland so also in the Highlands, the potato crop was struck by blight. The damage, though widespread, was not complete, and everyone relaxed until in 1846 blight struck again, and the whole potato crop was left rotting in the fields. All the consequences of famine then quickly followed. Scurvy and typhus, diseases of malnutrition, killed hundreds. The famine-stricken population, weakened and listless, fell victim to cholera outbreaks, and only help from outside could relieve the situation. Private charity might provide some help, and so might the state, but, in the first instance, the sufferers looked to the chiefs for protection as generations of experience had taught them to do. Some landowners responded with admirable sense of obligation. MacLeod of Dunvegan bought in food for his people, some eight thousand of them, and permanently damaged the fortunes of his family by so doing. MacLean of Ardgour provided food, and introduced new crops into the area - peas, cabbages and carrots - to replace the potatoes. Sir James Matheson on Lewis spent £329,000 on improving his lands, hoping to provide a more secure future for his people. Others did nothing. Gordon of Cluny, owner of the Uists and Barra, was later reported as 'most negligent'. On Skye on the estates of Baillie of Dochfour, 'fertile land (was) lying waste - peoplewas seen a starving.' In Knoydart, around Arisaig, Lord Cranstoun showed total indifference to the situation, leaving attempts at relief to a tenant, MacDonald of Glenaladale, and to the parish priest, Father MacIntosh. 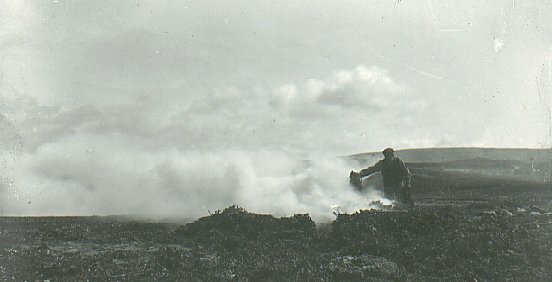 One who particularly disgraced himself was Lord MacDonald, who was publicly denounced by the depot officer at Portree. MacDonald had bought meal, which had been made available for relief purposes, in Liverpool, but re-sold it at a profit instead of bringing it home. The government was reluctant to act. These were years when the economics of laissez-faire prevailed, and politicians felt unclean if they had to interfere with the workings of the market, where supply and demand should dictate the terms of trade, and where any action by the state was seen as a distortion of natural processes. The scale of the disaster was so great however that the Assistant Secretary to the Treasury, Sir Charles Trevelyan, already in charge of relief measures in Ireland, had his powers extended to Scotland as well. Using the resources of the Admiralty, depots for food distribution were established at Portree and Tobermory, supervised by an official whose name was improbably apt - Sir Edward Pine Coffin. A Central Board of Management to co-ordinate charitable efforts was established in February 1847, and from its offices in Glasgow and Edinburgh, supplies were despatched to the affected areas. A ration was fixed of 11/2lb. of meal per day for a man; 12oz. for a woman and 8oz. for a child. Donations in cash and in kind came from America and Canada, and by mid 1847 the crisis had passed, and the depots were closed. The harvest showed great promise, but gales caused widespread damage, and potato blight struck again. The Board began all over again, but showing a new approach. Its members had been criticised as being too concerned for the suffering, and not alert enough to the need to keep everyone up to scratch. So now the victims had to make some gesture towards earning their rations. They were to work an eight-hour-day for six days a week in return for their meals. Meal supplies would be reduced as a punishment for any 'idleness', because, as Trevelyan put it, 'dependence on charity is not to be made an agreeable mode of life'. At the prices of the time the meal on offer to a man, his wife and six children cost three shillings and two pence per week - sixteen pence. The lowest working wage of the time was thirty pence. There seemed very little risk that Trevelyan's fears would be realised. In 1848 and 1849 the crops failed again, and all the devices to provide work whereby meal might be earned became more and more absurd for half starved people. In 1850 the Board's funds were exhausted, and its members simply announced that its activities must end. So, at the last, responsibility for the people fell again on their own social leaders, the landowners, who were now faced with having to pay extra local rates - the Poor Rate - of almost six pence per £1 on the value of their five estates. In Skye and the Hebrides the rate was almost fourteen pence. The Poor Law Board, under whose scrutiny the conditions in the Highlands now fell, saw the mass removal of a surplus population as providing the only answer to the problem. In 1857 Parliament encouraged this removal by the Emigration Advances Act, and in 1852 there was formed the Highlands and Islands Emigration Society. The best that chiefs could now do for their people was to make arrangements for emigrant ships to call, to take away into the refuge of exile the people who might have made their land sustain them, but had never been allowed to hold enough of it to make success possible. 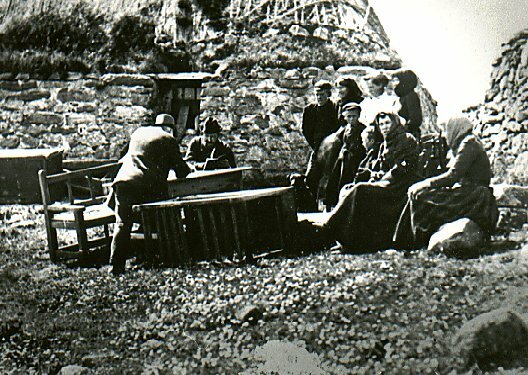 Except for a few scattered acts of resistance on South Uist, Barra and Benbecula, the deportees went quietly; and where a pathetic defiance was offered, the owners and their agents destroyed all shelter, and the law backed them up. The lack of resistance, unlike the behaviour of the Irish, was later admitted to be 'an important reason for official neglect.' Hugh Miller - labourer, geologist and theologian - summed up by writing 'the poor Highlander will shoot no one . . . and so they will be left to perish.' There was no resistance because there was no notion in the Gaelic community of such a thing. The clan had deferred to its chiefs, had honoured them, followed them to death itself. They had never combined against their chiefs; the very concept was beyond them. Homesick, and emotionally scarred forever, they boarded the ships for Canada, and elsewhere, where they could recreate their glen, living off the land and using their own tongue. But the Atlantic was wide, and the journey for most was for ever. The people who went, exploited, rejected and betrayed, suffered all the mental sorrows and physical hardships which their exile brought. The country from which they were evicted suffered too. Scotland lost half her heritage, and the desolation which then began has never found a remedy. Jacobite defeat at Culloden had brought about the destruction of the old social system in the Highlands, and these further disasters had removed any hopes that a successful new way of life could be devised for the people who remained. It is remarkable, therefore, that the image of Scotland, which the rest of the world holds, is a Highland one, with tartan and bagpipe, the most immediately recognised symbol of a Scottish presence. In part this is due to the regard quickly earned by the Highland regiments in the British army, where the military traditions of clans were encouraged and directed against Britain's enemies. This war-like, chivalrous side of the Highland story, whether fact or myth, was given world-wide credibility by the work of Sir Walter Scott. Scott, in the poetry which formed the bulk of his early work, had chosen to write on themes of a romantic and heroic character, frequently with a Highland setting; and he quickly captured the attention and admiration of the literary and literate world. In 1814 he published, anonymously, his first novel, Waverley, set in the period of the 1745 Rising. The impact of Waverley was sensational throughout Europe and America. It was the most influential book of its time; the qualities of its characters were taken to be desirable examples of behaviour, and the favourable image of Highlands and Highlanders which it conveyed brought respect and goodwill to the whole country. Such goodwill was even extended by the Crown. George III moved emotionally away from the Hanoverian loyalties of his predecessors; George IV, persuaded by Walter Scott, made a dramatic royal visit to Scotland in 1822, and Victoria found her preferred holiday home in the Highlands. Even economically, Scott, with Waverley and then Rob Roy, helped to create a branch of the textile industry producing tartan cloth which had become suddenly fashionable. Scott's political sympathies were Cavalier, Royalist and Jacobite, and it is fitting that he brought some comfort to the region and the people who had suffered for these very sympathies.